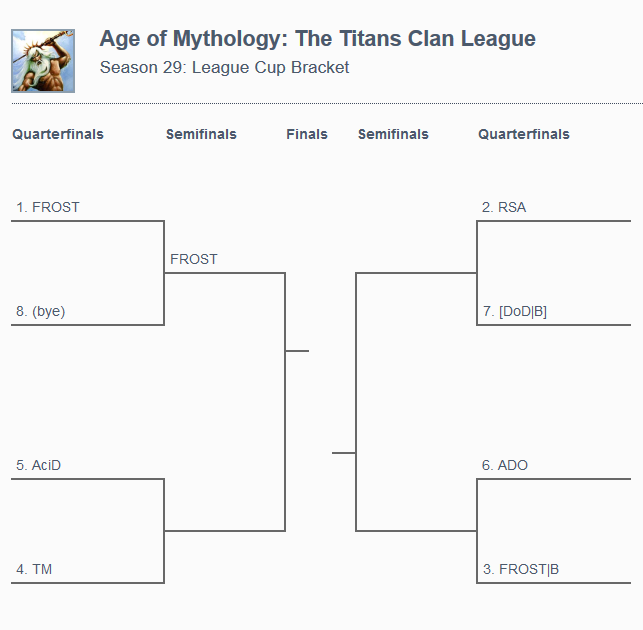 RTSL League Cup is a unique postseason bracket competition for the clans whose season would have been previously over by now, but not anymore - now you have a great opportunity to still make the season count, as you will battle for the sole and unique award - a League Cup! The system is simple - single elimination bracket, 1 round per week, each match a "best of 3" (third game, if necessary, played on Random), seeding random. So get ready and be the team to lift the shiny League Cup! Please upload all the played games to the RTS-Sanctuary's RTS League Replays Forum only and post the result of your match here in the scheduling thread - staffers will update the bracket for you.